It is possible to find skin cancer early. This cancer begins where we can see it. 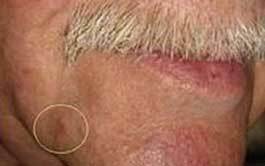 The first sign may be a slowly growing bump, a changing mole, or a dry and scaly rough patch. When treated before it spreads, most skin cancers can be cured. Even melanoma, a type of skin cancer that can spread quickly, is curable when treated early. The key to finding skin cancer early is to know your skin. The following pictures show you some of the many ways that skin cancer can appear on the skin. If you notice a spot or lump that is growing, bleeding, or changing, you should make an appointment to see a dermatologist. The spots on this man’s hand are AKs, a type of precancerous growth. Many people mistake AKs for age spots. AKs can also look like red, scaly growths. If you have age spots or other spots on your skin, it’s important to see a dermatologist. 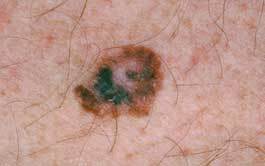 Basal cell carcinoma (BCC) This is the most common type of skin cancer. Most BCCs are very treatable. Seeing a dermatologist early is important. BCC can grow deep, making treatment more difficult. Melanoma This skin cancer can spread quickly. When treated before it spreads to the lymph nodes, the cure rate is nearly 100%. Be sure you know the early signs of this very serious skin cancer. 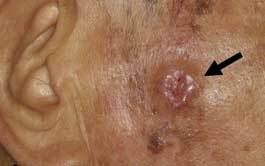 Squamous cell carcinoma (SCC) This skin cancer tends to form on skin that has been exposed to the sun for years. When found early and treated, SCC is curable. SCC can spread, making treatment more difficult. 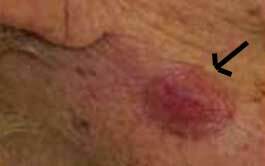 Merkel cell carcinoma (MCC) This skin cancer is rare. It is also aggressive. If you have been diagnosed with MCC, find a doctor who has experience treating it. 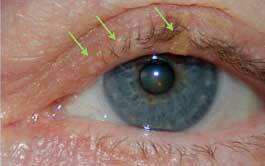 Sebaceous carcinoma This cancer often begins on an eyelid. If you have a stye, chalazion, or pink eye that just won’t go away with treatment, make an appointment to see a dermatologist. Dermatofibrosarcoma protuberans (DFSP) DFSP grows slowly and rarely spreads. Treatment is important because DFSP can grow so deep it reaches the bone. If a dermatologist finds something that looks like skin cancer, the dermatologist will remove it (or part of it). The removed skin will be sent to a lab. Your dermatologist may call this a biopsy. Skin cancer cannot be diagnosed without a biopsy. A biopsy is quick, safe, and easy for a dermatologist to perform. A biopsy should not cause anxiety. The discomfort and risks are minimal. How do dermatologists treat skin cancer? Stage of the cancer (how deeply the skin cancer has grown and whether it has spread). Excision: To perform this, the dermatologist numbs the skin and then surgically cuts out the skin cancer and a small amount of normal-looking skin. This normal-looking skin is called a margin. There are different types of excision. Most excisions can be performed in a dermatologist’s office. Mohs surgery begins with the surgeon removing the visible part of the skin cancer. Because cancer cells are not visible to the naked eye, the surgeon also removes some skin that looks normal but may contain cancer cells. This part of the surgery is performed one layer at a time. After removing a layer of skin, it is prepared so that the surgeon can examine it under a microscope and look for cancer cells. If the surgeon sees cancer cells, the surgeon removes another layer of skin. This layer-by-layer approach continues until the surgeon no longer finds cancer cells. In most cases, Mohs surgery can be completed within a day or less. The cure rate for skin cancer is high when Mohs surgery is used. Curettage and electrodesiccation: This surgical procedure may be used to treat small basal cell and squamous cell skin cancers. It involves scraping the tumor with a curette (a surgical instrument shaped like a long spoon) and then using an electric needle to gently cauterize (burn) the remaining cancer cells and some normal-looking tissue. This scraping and cauterizing process is typically repeated 3 times. The wound tends to heal without stitches. Sometimes, curettage is used alone. What outcome can someone with skin cancer expect? If it is caught early and properly treated, skin cancer can be cured. Even melanoma, which can be deadly, has a cure rate of almost 100 percent when treated early. Even if you get a clean bill of health, you need to continue to see your dermatologist. Once a person gets skin cancer, the risk of getting another skin cancer is higher. Sometimes skin cancer returns. Your dermatologist will tell you how often you should return for checkups. Without early treatment, the outcome is not as favorable. Skin cancer can grow deeply. Removing the cancer can mean removing muscle and even bone. 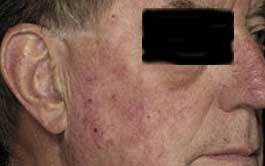 Reconstructive surgery may be needed after the surgery to remove the skin cancer. And skin cancer can spread.